The New World reveals a warning of the great change coming to our world and a prophetic vision of a future world for which we must prepare. The New World is a warning from God about humanity’s rapid depletion and degradation of the Earth, its climate and its environment, and the urgent action we must take, individually and collectively, to both restore our planet and prepare for a new world condition in the future. This book reveals the grave plight of humanity and the deeper causes of a global tragedy of conflict, poverty and oppression now spreading worldwide. With this, it presents God’s Plan for the world and what can save humanity as it faces its greatest trials in the future. The New World is the prophetic prelude to The Great Waves of Change, which presents in greater detail the challenges we will face individually and the pathway of inner and outer preparation available now through the New Message to each person. Each chapter of The New World is a revelation given from the Source, compiled into this text by the Messenger, Marshall Vian Summers. Several chapters of The New World were received in locations of growing conflict and instability, including in Beirut, Aleppo and Tehran. 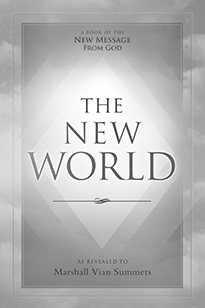 The New World is the seventh book of Volume 1 of The New Message from God. The New World will be available online and in print in 2019 at New Knowledge Library. Prior to release, several chapters of The New World are being made available to the world.